Nylon Tags - Industrial | Ketchum Mfg. Co. 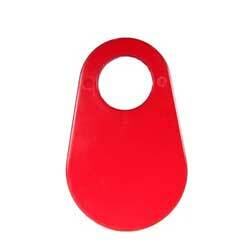 When customers think of “neck tags,” they most likely think in terms of firefighter accountability, kennel I.D. tags, and other common applications. In reality, though, Ketchum Mfg. Co.’s industrial-strength neck tags have a multitude of practical uses you may not have thought of. They are essentially miniature signposts that can be attached anywhere to communicate important identifying information about all manner of objects, from pipes and wiring to tools and supplies, and much more. 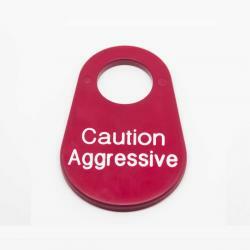 Used for identifying caged animal requirements, warnings, and conditions. 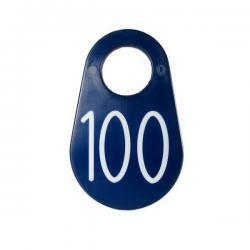 These heavy-duty neck tags, which are pear-shaped, are 0.175″ thick and measure 3½″ high by 2¼″ wide (at the widest part), with a 1″-diameter hole at the top. On the sequentially numbered tags, the engraved numerals are 1¼″ tall with a 0.115″ strike. For maximum versatility, combine our nylon neck tags with bolt snap hooks, trigger snap hooks, ‘C’ clip carabiners, or other connectors.